"With Cluster of Lies, Marquis continues to keep me awake at night. I enjoy how he blends together science and his knack for storytelling to craft an insightful and entertaining tale." "The Coalition' has a lot of good action and suspense and an unusual female assassin." "In his novels Blind Thrust and Cluster of Lies, Samuel Marquis vividly combines the excitement of the best modern techno-thrillers." In this second thriller in the Joe Higheagle Environmental Sleuth Series, mysterious deaths are taking place in the Rocky Mountain region outside Denver, Colorado. Joe Higheagle--a full-blooded Cheyenne geologist who has recently become an overnight celebrity for bringing down a billionaire corporate polluter--is hired to investigate Dakota Ranch, where four boys have recently died from a rare form of brain cancer, and Silverado Knolls, a glitzy soon-to-be-built development. He quickly finds himself entangled in an environmental cancer cluster investigation as well as a murderous conspiracy in which friend and foe are indistinguishable and a series of seemingly impenetrable roadblocks are thrown in his path. I am going to say dreaded words that no author or some readers ever want to hear when you start a review but here they are: Suspense isn't my normal genre preference, eek, yep I said it. Here's the part that makes up for that though....with a Samuel Marquis book I always find that this is a genre I should be reading more of, one that I could easily get lost in and always wonder why I don't read more of it. Cluster of Lies is a fast paced, heart racing, action packed suspense with a whole lot of heart involved. It reminded me of a mash-up of Erin Brockovich and The Da Vinci Code. A story that will grip you, have you googling up information and wanting to take on the world and all the injustice that is happening around us but hidden from view. It is easy to see how much the subject of this book means to the author and he pulls in his background as a geologist to bring a solid honesty to the story. You can go into this knowing that while the story may be a bit wild and crazy, totally a fiction suspense novel it will have an underlying truth at it's core. Joe Higheagle may be a fictional hero but the world that he is working in is real and when you are done with this book you'll be wishing that Joe wasn't a character made up in the brilliant mind of Samuel Marquis, you'll wish he was out there fighting to make this world a better place. There are a lot of things that I loved about this book. I love Joe Higheagle and his passion to make this world better, I loved Sally, a woman who has nothing to hope for but finds hope in everything, a woman who is so beaten down she's hanging on by a thread but pulls herself up and finds reasons to smile. I love the narrative, the background, the inclusion of Native American history, lore, and beliefs. It's important to note that Samuel does justice to Native American culture. He's not using it as a way to sell a book, but as a way to tell an honest story that has substance, and it is clear that also in this respect he brings forth the knowledge needed to do justice when writing about a culture that is not his own. I also adore Joe's grandfather and am so glad that he is a staple through to the series and then there is the subtle snark that you don't expect to find but will have you quietly laughing to yourself as you turn the pages. When a book like this comes with such a heavy subject that snark is much appreciated and my favorite thing is that it simply sneaks up on you when you least expect it. You'll find that while this isn't a 'short' novel it will be a quick read because once you start you simply become so immersed in the story that you lose track of the world around you and before you know it you're closing the back cover. 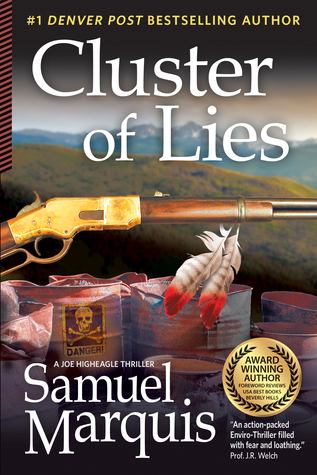 While Cluster of Lies is a part of the Joe Higheagle series you do not have to have read the first book in the series. Each book is a bit of a standalone with in the series. As always though I think in the end you will want to read all the books so you might as well start at book one, it will also just give you that little bit of extra background into who Joe Higheagle is, but not a must! This is a fantastic read for any Thriller or Suspense genre fan...even if you aren't typically one (like myself) I will tell you that this is a fantastic book to pick up and get lost in! 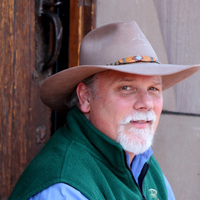 Samuel Marquis is a bestselling, award-winning suspense author. An Expert Witness in groundwater contaminant hydrology, he works by day as a VP-Hydrogeologist with an environmental firm in Boulder, CO, and by night as a spinner of suspense yarns. His first two thrillers, The Slush Pile Brigade and Blind Thrust, were both #1 Denver Post bestsellers, and his first three novels received national book award recognition. The Slush Pile Brigade was an award-winning finalist in the mystery category of the Beverly Hills Book Awards. Blind Thrust was the winner of the Next Generation Indie Book Awards in the suspense category, an award-winning suspense finalist of both the USA Best Book Awards and Beverly Hills Book Awards, and a Foreword Reviews' Book of the Year award finalist (thriller & suspense). His third novel, The Coalition, was the winner of the Beverly Hills Book Awards for a political thriller. Former Colorado Governor Roy Romer said, "Blind Thrust kept me up until 1 a.m. two nights in a row. I could not put it down. An intriguing mystery that intertwined geology, fracking, and places in Colorado that I know well. Great fun." James Patterson compared The Coalition to The Day After Tomorrow, the classic thriller by Allan Folsom. Donald Maass, author of Writing 21st Century Fiction and two novels, compared The Coalition to The Day of the Jackal. Other book reviewers have compared Bodyguard of Deception to the spy novels of John le Carré, Daniel Silva, Ken Follett, and Alan Furst. The first thriller in Mr. Marquis's World War Two Trilogy, Bodyguard of Deception is currently a Top 10 Best World War II Spy Book and Top 10 Fiction Book Set During WWII on Goodreads along with such WWII thrillers as Follett's Eye of the Needle and The Key to Rebecca, Daniel Silva's The Unlikely Spy, and Ben Mcintyre's Agent Zigzag and Double Cross. Mr. Marquis lives in Colorado with his wife and three children and he plays competitive lacrosse, hikes, and skis on weekends when he isn't writing.